Joe Landino has served as chief information officer and director of mission systems at the National Counterterrorism Center since December 2014. Prior to his current role, Landino was director of the open source engineering group within CIA‘s Open Source Center for nearly four years. He helped engineer and develop information technology infrastructure and applications at OSC as well as led cloud migration efforts there. He also worked for the National Geospatial-Intelligence Agency on a joint duty assignment as deputy program manager of the National System for Geospatial-Intelligence. Between December 2003 and May 2008, Landino served as deputy director of the National Reconnaissance Office‘s imagery intelligence systems acquisition directorate (IMINT). 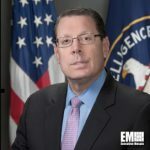 He came to CIA in 1999 as senior IMINT manager in the agency’s Office of the Senior Acquisition Executive for the Deputy Director of Central Intelligence for Community Management. Landino is a former U.S. Air Force officer who served as a systems acquisition professional at multiple product centers, test agencies and headquarters elements. He also worked in the private sector as MCR federal group manager with responsibility over the McLean, Virginia-based company’s consulting practice that worked with the Defense Department and intelligence community. He holds a bachelor’s degree in economics from Franklin Pierce College and a master’s degree in public administration from University of Denver as well as master’s degree in systems management from the Air Force Institute of Technology.